Laugh your way through Eddie Murphy’s 1996 Academy Award-winning (see, you’re learning things already!) comedy with these 15 little-known facts. 1. The film is based on the 1963 Jerry Lewis comedy of the same name. The Jekyll and Hyde-like storylines are mostly the same in both films, as is the name of the protagonist’s alter ego (Buddy Love). However, while Eddie Murphy’s Sherman Klump wants to lose weight, Jerry Lewis’ character wants to bulk up to become a jock. 2. The weight loss storyline was inspired by daytime television. Murphy allegedly came up with the weight loss theme of the movie while watching a daytime chat show’s segment on the topic. 3. Lewis served as executive producer on the 1996 version of The Nutty Professor. He also executive produced its sequel, 2000’s The Nutty Professor 2: The Klumps, and would go on to produce and star in a computer-animated sequel to his original film—also called The Nutty Professor—in 2008. 4. But it turns out Lewis isn’t really a fan of Murphy’s version. 5. Lewis allegedly turned down a cameo in the movie. His reason: He thought the script had too many fart jokes. 6. The Nutty Professor was also produced by business mogul and Def Jam Recordings co-founder Russell Simmons. Simmons loved Lewis’ version and always wanted to do an updated version. In fact, Lewis’ version inspired Simmons’ comedy series Def Comedy Jam, which is referenced in the remake. Murphy and the producers wanted famed director John Landis to direct The Nutty Professor. Landis had worked previously with Murphy on the films Trading Places, Coming to America, and Beverly Hills Cop III. 8. … but he seemed to have the magic touch. The Nutty Professor was the second in a string of four consecutive comedies directed by Shadyac to gross more than $100 million worldwide. The other films were Ace Ventura: Pet Detective, Liar Liar, and Patch Adams. 9. Eddie Murphy plays a total of seven characters in the film. He plays every member of the Klump family except for Ernie Klump Jr., the nephew who is played by actor Jamal Mixon, as well as the Richard Simmons lookalike, Lance Perkins. 10. There’s a story behind Dave Chappelle’s character’s name. The rude comic played by Chappelle is named Reggie Warrington after director Reginald Hudlin and his brother Warrington. Eddie Murphy allegedly had a falling out with the brothers after appearing in 1992’s Boomerang, which Reginald directed and Warrington produced. 11. Jada Pinkett Smith chose The Nutty Professor over Independence Day. Pinkett Smith, who plays Carla Purty, wasn’t able to star in Independence Day with her then-boyfriend (and now-husband) Will Smith because she had already accepted her role in The Nutty Professor. 12. A lot of work went into those crazy dinner scenes. To make the Klump family dinner table scenes work seamlessly, Murphy performed each role one at a time. While filming each new character, he would use an earpiece that played audio of himself as the Klump family members he’d already shot. He repeated this process for days until the entire scene was complete with each family member’s dialogue. 13. Grandma Klump is based on the pioneering comedian Moms Mabley. 14. The suit and practical effects that Eddie Murphy had to wear were created by Academy Award-winning effects designer Rick Baker. Baker made an entire body cast of Murphy in order to create the lightweight, hand-carved eurothane foam and spandex suit that would make the actor appear 450 lbs. Other parts of the suit were filled with cellulose and water to make it move believably. It took three hours to apply the makeup each day for the entire 70-day shoot. 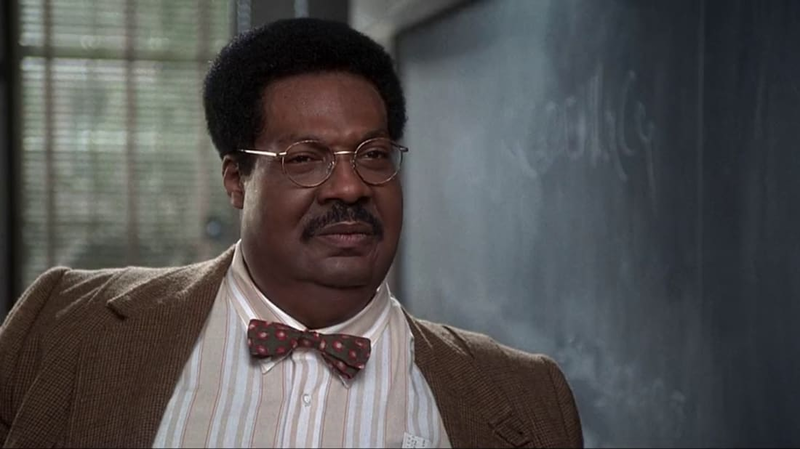 Baker and his team would go on to win the Academy Award for Best Makeup for The Nutty Professor. 15. Eddie Murphy was allegedly paid $12 million to star in The Nutty Professor.